The presentation begins with a walkthrough of the service and wallet activation, card enrolment and NFC payment processes for users. 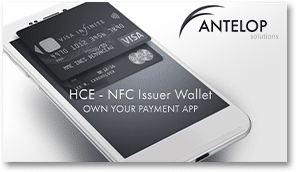 It then describes how Antelop’s solution connects to the Visa VTS and Mastercard MDES tokenization platforms and provides a client use case where Antelop was able to launch a live HCE service for a large Mastercard issuer in under six months. The presentation then sets out how Antelop’s platform provides issuers with seamless integration to multiple payment schemes and details the integration support the company provides to its clients. This presentation has been produced and sponsored by Antelop Solutions and approved by the NFC World editorial team. This 16-page slide deck is available free of charge to NFC World Knowledge Centre members (PDF format, 1.9MB).